Now let's talk PPC (pay per click) - still a favorite topic among large portfolio owners. 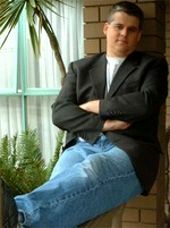 For this subject we called on Australian Michael Gilmour, author of one of the best of many great blogs that came on the scene in 2007, Whizzbangs Blog. PPC is Gilmour's specialty and I don't know anyone that has studied it more closely or who has a better understanding of that category. In reflecting on the key trends in 2007 Gilmour said "I think of a question like this first of all in terms of what impacted my income and the valuation of my domain assets and secondly what occured that would increase my expense line. In these three terms we can see that 2007 was a year of great change. Earnings Per Click for parked domains has continued to decline. This is against the trend of increased advertising dollars that have been flowing into the industry. Generally speaking increased traffic due to greater numbers of people spending more time online has largely shielded the monthly income for domain owners. Domains sales have increased in both volume and value but have largely been funded by individuals within the industry rather than external entrants. Debt as an instrument of funding domain acquisitions has entered the marketplace in a meaningful structured manner and this has assisted in a continued increase in the value of domains. This debt funding combined with the proliferation of both online and offline auctions has continued to place an upward pressure on the average domain sale value. One of the most under-rated and often misunderstood events occurred with the introduction of the direct channel to market by both BuyDomains and Fabulous. Reaching the market has always been a huge problem for domain owners who have been wanting multiples based upon "generic value" rather than multiples based upon PPC income. This year both BuyDomains and Fabulous have built systems and partnered with registrars (most notably Godaddy) to access this market. Suddenly the domain portfolio "long-tail" has a potential value even if the domains are not receiving traffic. Standards and transparency was first placed on the table in a serious manner. This has been a huge issue with me as I believe that the industry needs to take steps to reassuring both domain owners and advertisers that value is being created and can be proved to being created. The reason why this is important is that when industries have adopted standards and transparency the value of the assets in the industry and the flow of money into the industry has typically increased. The rise of the registration price of a .com domain was to be expected and the increase has particularly impacted the bottom line of the some of the larger portfolio owners. Even a small increase in price multiplied by hundreds of thousands of domains can mean that the more speculative domains are dropped rather than renewed. Standards and transparency will become the number one issue for the industry this year. The first T.R.A.F.F.I.C. conference in Las Vegas this year is themed around "standards & transparency". Once standards are uniformly adopted I believe that the industry will begin to see some serious external money enter the industry as the domain asset class is legitimized to the financial community. This is great news for domainers if it can be pulled off! There will be an increased number of support companies for the industry that assist domainers in managing their portfolios of domains. This is similar to the gold rush spawning shovel and pick manufactures. Many of these companies will become very lucrative and go on to become very successful businesses but I believe that a lot of them will soon disappear. I wouldn't be surprised if a number of the parking companies merge or begin merger talks by the end of the year leaving only a few major traffic aggregators and a host of smaller options for domainers. The main driving force behind this will be the need to aggregate more traffic so that "mega-parking" companies can put increased pressure on the margins of the advertising aggregators (Google and Yahoo) and also domainers. There will continue to be an increasingly greater number of domain auctions both on and offline. At the moment we have a huge supply of domains wanting to receive exposure in the auctions and millions of dollars swapping hands within the industry. I wouldn't be surprised if the auctions begin charging to have a domain submitted for consideration to the auction process. This will cull the number of domains, limit the work of sorting through the domains by the auction companies and guarantee only high quality domains are up for auction. Not to mention the fact that this will make the auction side of the business even more lucrative than it already is. I mentioned that Gilmour was one of the new breed of bloggers that surfaced in 2007. DomainTools.com chief Jay Westerdal, who also writes an excellent blog that often breaks big news, feels that medium took over center stage last year. "2007 was the year of the Domain Blogger," Westerdal said. "A lot of domainers got a blog and started speaking their mind last year. This is an awesome thing for our market because it gives us a lot more voices. The cost of having a blog is nothing and the benefits are enormous." public areas as media advertisement where the domain name is used in the advertising and pushes customers to the product/company," Westerdal said. 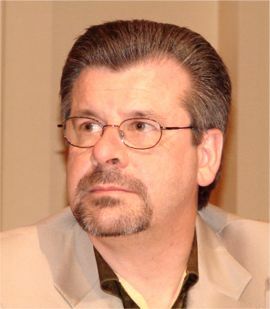 Looking ahead to 2008 Westerdal told us, "Consolidation will occur among the leaders and new companies will take shape. The domain market will start becoming more mainstream and in simpatico with internet/web industry blending the line between them. Companies based primarily in web hosting and connectivity will begin to take stronger interest on the domain name market as it is the foothold of the industry. In the same sense, domain industry companies will expand into other internet-based products such as hosting and applications. Large portfolio holders will begin developing more aggressively." 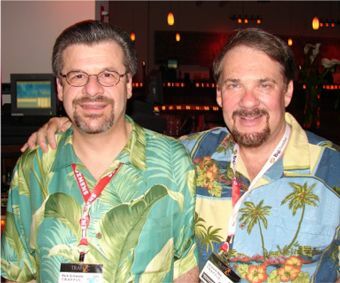 "I also predict Ron Jackson will get a blog in 2008 and become one of the most read domaining blogs. I have been hoping and praying for RSS feeds to hit Ron's content for a while. I rarely visit this great site and RSS would help me follow the site better," Westerdal said. (Editor's note: Jay has been on my case about this for a long time and I have to admit his advice is sound. I will have to see what I can do about making his predictions on these points come true). "My other major predictions are that Verisign will raise DotCom prices again in 2008 and domainers will get even madder this time. This price increase will continue to hurt small time domainers and compress earnings for large portfolios. IREIT wll quietly fade as they sell off their entire portfolio in 2008. Marchex will make a turn around in 2008 and go from $9 a share to $16 dollars a share. 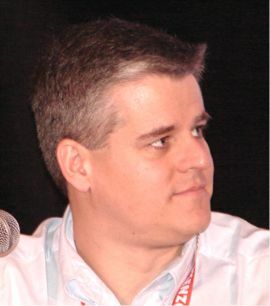 DomainTools will triple in size in 2008," Westerdal said. 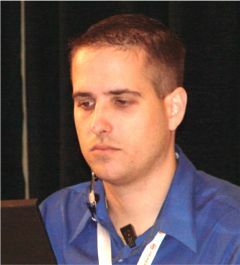 Westerdal also produces the Domain Roundtable conference which, along with DOMAINfest and T.R.A.F.F.I.C. comprise a powerful trio of general interest domain conferences that have had a dramatic positive impact on the domain industry and the rise in domain values. and Howard Neu at a party during T.R.A.F.F.I.C. East 2007 in Hollywood, Florida succeeding conference topping the one before. Of 2007, Neu said, "As I had predicted last year, the domain industry grew up in 2007 to be a full-fledged legitimate contender for investment funds throughout the world. This growing process was culminated in the recognition by Steve Forbes at T.R.A.F.F.I.C. East 2007 of the place in history that domain investment can be and will be. In the process, WALL STREET took recognition of the industry by attending and participating in T.R.A.F.F.I.C. New York and creating a dialogue that was previously lacking. This was especially reflected in the results of the Domain Auction conducted by Moniker which realized over $12 million in domain sales and reported by the New York Post and New York Times. The resultant increase in domain values was reflected in every auction of domains thereafter, whether at T.R.A.F.F.I.C. or elsewhere." Neu sees more of the same ahead in 2008. "I believe that the industry will continue to grow and receive widespread recognition as the mainstream investor learns more about the nature of domains, what they are, how they work, how they create traffic for web sites around the world, and how Direct Navigation is beneficial and the Parking Companies become more transparent as to where the money is coming from and where it is going. The Advisory Board of the World Association of Domain Name Developers, Inc (WADND) will be adopting Standards of Transparency for Monetizers to create a new Seal of Approval to be awarded to those PPC companies that provide the transparency that domainers require. There will also be some excitement this coming year with a T.R.A.F.F.I.C. West (Feb. 17-21) Road Rally in Las Vegas and the first T.R.A.F.F.I.C. that will be truly family friendly at Walt Disney World (May 20-24). The year will be topped off with going back to New York (Sept. 2008) at a different venue and culminating in the first international T.R.A.F.F.I.C. in Australia (November 2008) in conjunction with Fabulous.com on the beautiful Australian Gold Coast." predict how things will play out years down the road. Predictions he made about the rise in domain values a decade ago - thought to be pie in the sky dreams then - have become reality today. Schwartz says what is on his mind and let's the chips fall where they may. That has earned him both loyal friends and dogged detractors. It also makes him what we in journalism refer to as "great copy". As someone who came out of the TV business Schwartz reminds me very much of Captain Outrageous - Ted Turner who was one of the most fascinating characters in my previous profession. Like Turner, Schwartz is one of a kind. He has been such an integral part of this business it is hard to imagine it without him - it would be very much like switching from watching color TV back to watching black and white. He's colorful, candid and controversial and that makes him the perfect guy to close the show. "2007 was a BIG year. No question about it," Schwartz began. "Payouts were up dramatically for the first half of the year and even during challenges of the latter part of the year have remained strong. Domain Values continue to rise throughout the year as your reporting indicates. I think the most significant change is all the live auctions that are popping up after watching the dramatic success of the live T.R.A.F.F.I.C. auctions. In 2007 34 of the top 100 sales for the entire year came from the TRAFFIC/Moniker auctions. That is pretty significant. If you dig a little deeper it will reveal that Moniker had a hand in nearly 50% of all the high ticket domains in 2007. There are many moving parts in a live auction and if you are a seller you want to be assured that you will receive the highest market value. If you are a buyer you want quality names at an uninflated price. When you can present a proper balance, everyone comes out a winner. Next would be all the blogs that have popped up with Frank Schilling leading the way. To watch and read and listen to all the top domainers share their ideas and stories and views is a great gift to all of us and hopefully will spill over in the mainstream business world. 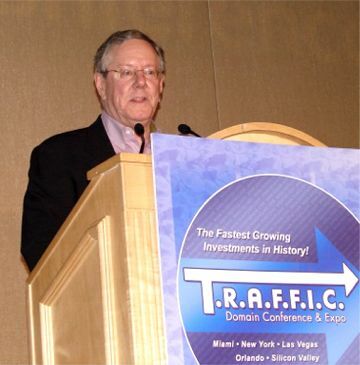 But of all the things that happened in 2007, I think having Steve Forbes come to speak to the domain industry in October was the single highlight not only of this year but of my career in domains. When I think back to where we came from and how drastically the landscape has changed over the years, I believe we will look back at that moment for years to come. Some of his quotes are being used on many sites I see. genuinely impressed Mr. Forbes was when he met us. He really got off on what we all do. He has such a deep respect for entrepreneurs. Especially for a group like ours that has taken great risks and have a lot of successes to show. I think his appearance will pay dividends for the entire industry for years to come. It demonstrates that we are a serious group with a record of accomplishments and not afraid to aim high. I have had contact with Mr. Forbes a couple times since his appearance and I think he knows that we are a group that is making and writing history. I think our paths will cross again." "As for business, 2007 had a lot of ups and downs but the end result was a record breaking year on multiple fronts." And how about the year ahead? "No question the industry is maturing and with that comes growing pains and conflict," Schwartz said. "So while the best days are still in front of us, the accomplishments will not be quite as sweet as the earlier ones. They may be bigger, just not sweeter. Human nature is kicking in and many will lose a sense of where they came from and who they are. You can’t do anything about it unless you know you are caught up in it. Normal has a way of changing. So we will all be well served by keeping our eyes opened for pitfalls that come with the territory." "One of those pitfalls will be addressed at T.R.A.F.F.I.C. We know the guys upstream are making more money and we know domainers are getting less. So TRANSPARENCY will be the focus and theme for our 2008 T.R.A.F.F.I.C. shows. Isn't it just plain silly or worse that you count your frickin' change from a $20 bill at McDonalds and don't use the same due diligence when millions are at stake? How smart is that? If you are told you are getting 65% then you have a right to make sure that is the rate you are actually getting. You also need to know if that rate is 65% of what they get paid or is it after expenses? Now let’s shift gears and really mix it up. Everyone knows I am about the most optimistic person you will ever meet. But my optimism is never divorced from reality. Reality is what IS whether we like it or not. I will probably take some heat for what I have said and even more for what I am about to say, but so be it. The following was a blog post I was going to make this week. I think it would have more value here first. threat lays within the industry. Apathy, greed, wrong doing will surely put us all in jeopardy. While we do these things, our enemy is organizing and they will change rules and laws that will take YOUR domains and the earnings they currently make for you and your families and are actively trying to shift those dollars to their pockets for them and their families. But party on like a ship of fools my friends. My gift is seeing things before they materialize. But hey, don't pay attention. Don't believe it. Don't do anything. But I promise you that some day in the next 3-5 years (Maybe much sooner) I will point to THIS POST and let you know that there was an opportunity to avoid it but you were too busy laughing at what I suggest. The laughter no different than the day I "Wasted" my first $100 and bought a domain name. So I am quite used to it. The forces are gathering. You have a choice to ignore this. But when you do, ask yourself how you are going to feel when your domains are in jeopardy? When it is too late? When your domains are gone and the income along with them? 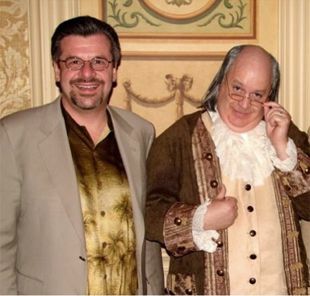 Schwartz brought Ben Franklin to T.R.A.F.F.I.C. I see what is going on daily when I get emails from the ICA. The threats are everywhere. Forces against us are joining together. If the domain industry does not get ahead of this we will all see the day in which some unfair ruling will be used to take your assets away from you. Those assets are worth a fortune. No matter what silly appraisal you have had, GREAT domains are worth much more than what they say. The proof will be obvious when you see the millions they will spend to get what you have at a FRACTION of the fair market value. There are storm clouds gathering and it is serious. Choose to ignore and you have only yourself to blame. The choice is easy, start educating yourself now. Get the ICA newsletter. Pay attention to the decisions and why domainers are losing domains. Do whatever you can to prevent what is IN PROGRESS. Or do nothing and start looking for your next career and how to replace your incomes. from you. Tax it away from you. STEAL your assets through legal means and I am telling everyone in the industry that they will WIN if you don’t step up and pay attention and support efforts to insure our futures. Steve Forbes related much of the same message as this has been done throughout history. Ask any of the top domain lawyers. Ask the top domainers. They all know what is coming. You will all live to see the day that billions of assets changed hands because some of the smartest folks on the planet failed themselves and their families. This is the one predication I don’t want to be right on. My job is to ring the bell as loud as I can and get the industry to take this seriously. 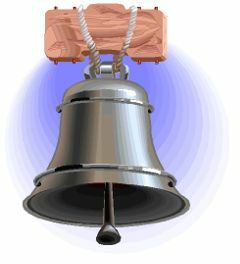 Consider the bell rung."